Here it is: we're tired of being a beta site. We believe we have been a consistently successful site, we've been around for more than eight years, we have over 1,000 avid users, we have 100% answered questions, and we get over 12,000 visits a day. We might not be as big as Stack Overflow, but we're certainly not "beta" anymore. Here are our stats, take a look for yourself. We are in need of migration paths to other SEs: Worldbuilding, Academia, Legal. As a beta site, we can't get those, and all those migrations fall on the shoulders of our three moderators alone — we are reduced to notifying them via flag that a post needs to be migrated. The whole process takes several days, when it could be done in a few hours if we had those migration paths. Reputation thresholds for privileges are very very low. As a result, users are reviewing posts, casting close and reopen votes on questions long before they are familiar with the workings of the Stack. As an example, over the past three days, I have received 540 reputation on the back of one post alone. 500 reputation is the threshold for casting close/reopen votes on beta sites. Would anyone here claim that a person who posted one good answer, and has been a member for 3 days, has enough knowledge to cast this kind of votes? Low reputation thresholds make sense for fledgling SEs with few users and few upvotes, where reputation gain is slow — not for us. The "beta" status is demoralising. Look here to what extent even our mods are demoralised. That's just not right. We're feeling rejected by Stack Exchange. We're a large community that feels stifled and hopeless. We keep saying all the above, and nobody listens. Every day that we look at the huge ugly "beta" label staring off the top of our page is an offence. You're going to tell us we're wrong to feel this way, you're going to say that this is illogical — but that is how we feel. The overwhelming vote for graduating has been standing for a year now, with no progress. How else would we feel? In and of itself, this is demoralising. Writing is different in its nature from programming. It does not raise as many questions that can be answered within the SE format. We are never going to get to 10 questions per day, no matter how strong of a site we are. Are we then to remain in beta forever? Are we to suffer forever all the damages mentioned above, and never enjoy the advantages that a graduated site gets? Photography, Christianity, Bicycles and RPG, among other examples, all graduated with less than 5 questions/day, three out of the four were also merely "okay" on another stat, while the fourth had a mere 3.4 questions/day upon graduating. Most strikingly, Quantum Computing is 10 months old. So it was allowed non-beta status with only 3 questions a day at the same time as we were denied it. Within a month from telling us 'no', Stack Exchange told another site with worse stats 'yes'. This unequal treatment surprises us, to say the least. In light of all the above, we, Writing.SE, ask for graduation, now. Design elements take time, we understand. But, as a first step, we ask for the removal of the 'beta' label, and for an official announcement that we are moving towards graduation. Surely that's not much to ask for? We have been told that "soon" graduation will no longer be a thing. But we have been told this a year ago, and have heard nothing since then. For a year since we've made the request, we have waited and suffered, and the damages of the site remaining in beta accumulated. "One day" the whole system would be redesigned. "One day" graduation would cease to exist. But when would that day arrive? They say there's nothing more permanent than the temporary. Well, how much longer must our "temporary" beta status last? If there are objective reasons why we should not graduate right now, we would hear them. If there are any recommendations as to how we could help our SE grow further, we would appreciate them. But we cannot stand to be ignored any longer. Other "beta" SEs — if you feel as we do — join us, speak your mind on this issue! Does the "beta" status stifle you as it stifles us? What changes do you need, that only graduation can bring? SEs who have graduated without the "excellent" stats required of us — what can you tell us about graduation? How has it affected your SE? Was it a positive change, or did graduating without perfect stats cause problems? We've done what we thought to be impossible. We've passed 10 questions per day. How can we advance our request to graduate? What blocks us? I agree with you on just about all of this. The smaller sites you cited were graduated quite awhile ago under a different system than we have now, but that is entirely besides the purpose of my post. I wanted to update everyone on what I've been working on because I've seen many discussions, proposals, and improvised solutions about how the Community Team might allocate various "graduation" features with or without a custom design (e.g. increased reputation threshold, elections, migrations, etc, etc). There hasn't really been a comprehensive solution regarding how this would work juggling ~173 sites, much less deciding which sites would be eligible and when/how it actually gets done. So efforts to handle each request one site at a time have been caught up in indecision, confusion, and a growing back log… which is not a good experience for everyone involved. In my opinion, the time for perpetual "beta" labels and holding back much-need features awaiting "graduation" has long passed. I am in the process of writing up a comprehensive site life cycle workflow which (among solving many other issues) would include breaking apart "graduation", and enabling each feature as soon as a community can reasonably support it. It's roughly based on the premise I outlined here — But what happened to Graduation?. I'm not precluding any intermediate action by waiting for some sweeping, comprehensive fix — it's worth noting that many beta sites are now having elections if the moderation team needs more help — but I am seeing a renewed drive for fixing this process once and for all, so hopefully we can roll this out more agile-y (release early, release often) so we can get sites going again sooner rather than later <fingers crossed>. I thought the new design–the responsive one–which was rolled out last year was supposed to speed up the design of new sites as well as fix bugs and add new features. I mean this entire issue boils down to a question of custom design. SE cannot seriously be arguing that Writing.SE, with those stats, should still be stuck in public beta. In 2010 and 2011 nobody suggested that a (novice) site might have to wait eight or more years before they could graduate. and here's the result: from now on, when a site starts to consistently receive ten new questions every day, we'll consider it for graduation. […] Thanks to many devoted users, it’s grown clear that smaller SE sites can do a great job of maintaining themselves and producing high quality Q&A. Not every site is going to be a blockbuster success, but our small sites are serving their own communities well. We’re proud of you, and we want you here. Has the criteria since changed? 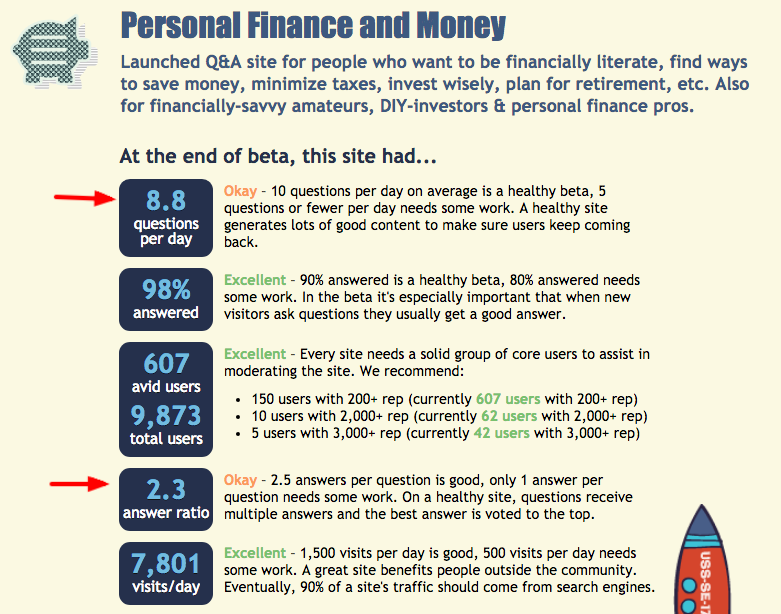 Is success and value ultimately measured by the number of questions posted daily? Are over 1,000 core users, and eight years of useful contributions secondary? Let the new system, the site life cycle workflow, which is said to be currently in the pipeline, come into force when it is fully completed. But why should Writing.SE still have to wait before they can enjoy the fruits of their hard-earned labor? How much longer? Money.SE is now called Personal Finance & Money SE and was promoted four years ago. Let's compare their stats with Writing SE as of today, 24 February 2019, and also for the benefit of users who have screen readers. 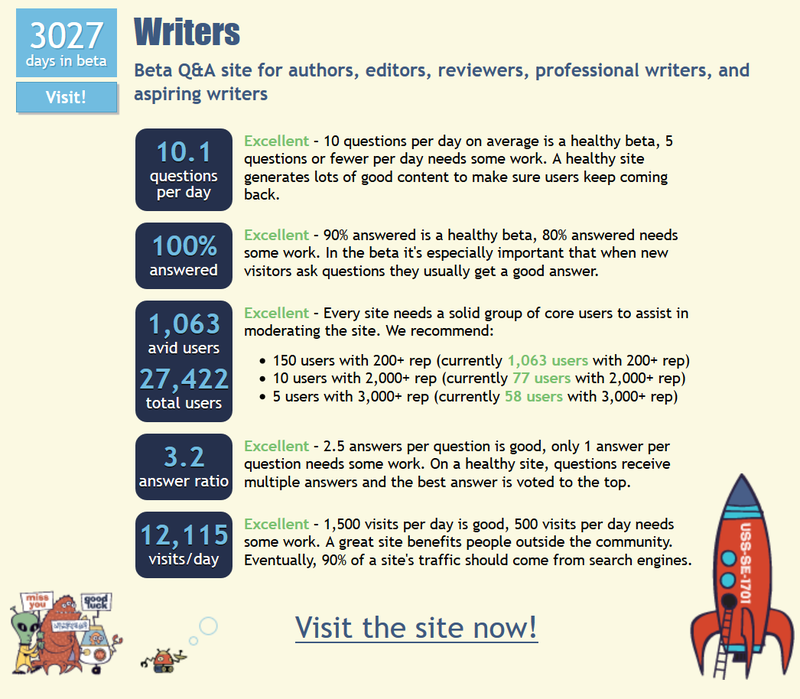 UPDATE Since February, the number of questions posted on Writing has increased to almost twelve questions per day. Not the answer you're looking for? Browse other questions tagged discussion feature-request graduating-sites . Are there any plans to graduate any beta sites soon?